In April of this year AMD launched the X470 chipset, a refresh of their motherboard platform that coincided with the launch of brand new Ryzen 2000-series CPUs. 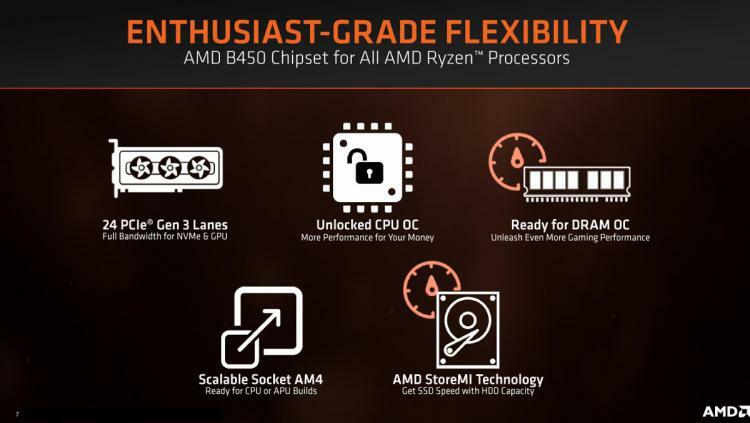 While this catered to enthusiasts eager to get stuck into this latest generation of Ryzen, those on a budget would have to wait a little longer for the refresh of AMD's more affordable B350 chipset. 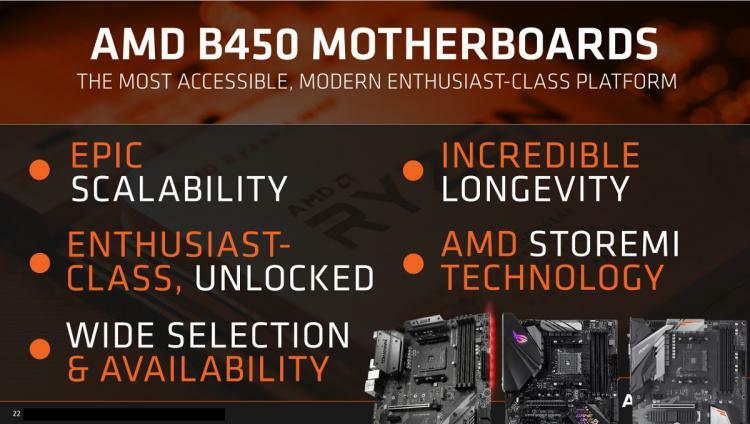 Today the wait is over as AMD present the B450 chipset for budget, mainstream and enthusiast users alike. Starting from prices as low as $70 MSRP, the B450 supports a full range of 1st and 2nd Generation Ryzen CPU and APUs. That's in part thanks to an ongoing commitment to the AM4 socket, which this week AMD have pledged to continue to use until at least 2020. Backwards and forwards compatibility (via BIOS updates) is therefore assured, in marked contrast to their competitors. 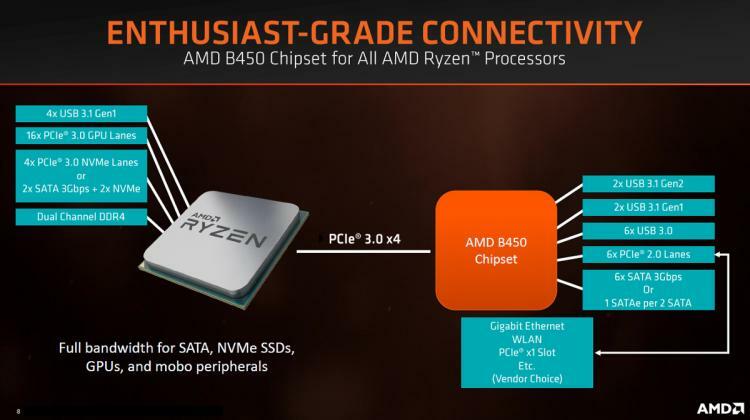 The full suite of Ryzen CPUs, from low-cost APUs such as the Ryzen 3 2200G all the way up to the flagship 8-core/16-thread 2700X, are compatible with B450. That platform scalability is core, and brings additional value to the AMD ecosystem that not everyone will need, but some will relish. In contrast to X470, B450 is intended to be the low cost entry-point into the mainstream platform just like its predecessor. 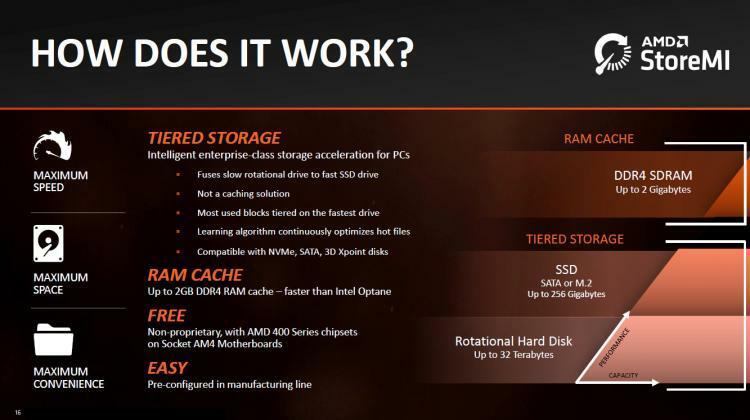 AMD aren't reinventing the wheel here, merely building on success of and learning lessons from B350. That's particularly the case when it comes to memory support; just like X470, B450 should have far better memory compatibility and stability than B350. Given Ryzen's sensitivity to memory speed, that's absolutely time well spent. While low-cost, B450 retains many of the benefits of the high-end X470 platform. Chief among these is support for overclocking; AMD’s entire CPU lineup as well as their B450 chipset are unlocked and support overclocking both CPU and memory, no fancy-pants prefix or suffix necessary. For those willing to dabble in the dark arts, and perhaps invest in aftermarket cooling, it’s possible to squeeze a heck of a lot more additional value out of the package as a whole. Nonetheless, chipset and CPU alone don’t dictate the overclocking capability of the platform. The other key is the motherboard itself - designed and built by an AMD board partner such as ASUS, MSI or GIGABYTE – which will have variable power delivery design, memory support and so on. As you will no-doubt already have seen however, each partner has a huge number of B450 motherboards launching today including small form factor ITX and full-size ATX SKUs, leaving you with plenty of choice. While B450 and X470 are similar, they're not identical. The biggest feature-level difference between the two is undoubtedly support for multi-GPU configurations via CPU PCIe lane bifurcation (i.e. supporting 8x/8x PCIe lane configurations). The X470 chipset has it, B450 doesn’t, even though both have access to the same 24 lanes PCIe 3.0 from the CPU. For the vast majority of users however this isn’t particularly important, and certainly neither AMD nor NVIDIA have put much emphasis on multi-GPU performance during this generation. A more pressing differentiator however might be power delivery for overclocking. Cheaper motherboards tend to have weaker power delivery – fewer phases, and with lower quality components – and better overclocking potential is a key way for motherboard vendors to up-sell their product line. Similarly, BIOS-level features may be lacking on some B450 motherboards, making OC profiles harder to tweak and perfect. If buying B450 with the express intention of overclocking, pay very close attention to reviews which analyse these aspects of the board. In terms of underlying mainstream features, the B450 chipset has pretty much everything you’ll need. Alongside a standard six SATA ports it also brings to the table two USB 3.1 Gen2 ports (new with B450), two UBS 3.1 Gen1 ports and six USB 3.0 ports, as well as optionally including Gigabit Ethernet or Wireless LAN. And of course you still likely have access to NVMe M.2 storage via the Ryzen CPU if the vendor has chosen to support it on that particular motherboard model. B450 will be one of the most affordable platforms on the market, certainly the most affordable that also supports CPU and DRAM overclocking. This contrasts with Intel’s strategy that gates off overclocking behind both K-Class CPUs and Z-Series motherboards. Entry points into the platform can be as low as $225 for both CPU and Motherboard, or be more effective on a cores/dollar basis compared to the competition. StoreMI was introduced with the X470 motherboard range back in April, and it’s fair to say that the feature was greeted with some confusion on day one. Many assumed it to be caching software similar to Intel’s Rapid Storage Technology or Optane Memory, and hence dismissing it because those technologies had little impact on their purchasing decisions. StoreMI however is very different, and explicitly not a caching system. While a high-speed cache sits in front of slower storage such as a mechanical drive, StoreMI instead utilises a technique known as tiered storage. Both (for example) slow HDD and fast SSD are seen as one contiguous drive by the OS, with a capacity equal to the two combined. Frequently accessed blocks of data, such as those used by the day-to-day workings of an OS, are moved to the SSD for faster access, while less often used blocks of data may remain on the HDD. Unlike a cache, no storage capacity is lost. With StoreMI you don’t need to install whole applications on an SSD to have it running at optimum speed. There’s no need to do the familiar dance of swapping games from your HDD to SSD because of the relatively low capacity of an SSD not being able to cope with a ballooning Steam library. Games like World of Warcarft, which currently have an installation size over 50GB, no longer need to sit bloated on your SSD; StoreMI will automatically organise and accelerate the ~4GB of data which is used in 95% of play sessions. StoreMI is free with both X470 and B350, and will utilise up to 250GB of data on an SSD (remaining capacity is partitioned off as an additional drive). It can be configured when you initially set up a system, or upgraded to later without the need to reinstall critical system files or the OS. To put that in context, a 256GD 2.5” SSD costs as little as $60 now, and could make an ideal post-purchase upgrade to a B450 or X470 system later down the line. NVMe M.2 drives are also supported, and the software will work alongside AMD RAMDisk configurations. 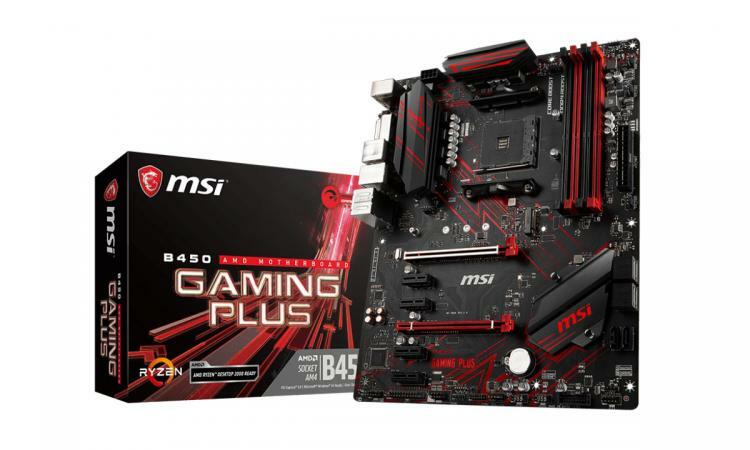 AMD B450 motherboards from partners are launching in retailers around the world as you read this article, many of which are priced exceptionally aggressively. Pair them with new Ryzen 2 CPUs and APUs, or take advantage of the plethora of deals for older Ryzen 1000-series CPUs that still offer great performance at an affordable price point. More information can be found at AMD.com.